Generally, I am not a fan of breakfast … or breakfast for dinner. It’s just not my thing (Unless it’s biscuits and gravy – then I’ll take a plate). However, my family acts like breakfast food is the best thing since sliced bread. If they know we’re having breakfast food for dinner – they act like they won the dinner lottery! On weekends, when I actually “make” breakfast … They’re right there like a pack of ravenous wolves waiting to be fed. There aren’t many breakfast foods I like … and I’d rather eat toast or an English Muffin on most days. On a very rare occasion – I don’t mind the idea of breakfast and will entertain eating breakfast for dinner. 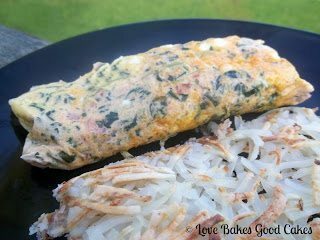 One of the best things about this recipe is, I don’t have to spend an hour making 7 omelets for our family. I can make ALL of them at the same time – and everyone can personalize their “bag”. Serve it up with some hash browns and fresh fruit … and it’s a pretty painless breakfast – that I’ll even eat! Chocolate Peanut Butter Banana – I’m just kidding …. I put that to see if you were paying attention and to make you say “ewwww” ….. LOL – However, if you try it, my kids want to know if it was good?! Never mind … I would not endorse anyone trying it – completely gross! This is more about the method, rather than an absolute recipe. Feel free to mix in things you know your family will enjoy! Bring a large pan of water to a boil. Meanwhile, if necessary, write names on the bags to identify the omelets. Crack eggs into the bag. Add desired mix-ins. Seal bag and squeeze the mixture to mix the ingredients well. Open the bag slightly and reseal bag removing as much air as you can. Using your fingers, squeeze the mixture back to the bottom of the bag. When the water boils, place bags in the water for exactly 13 minutes. (In my soup pot, I can easily boil omelets for my family of 7.) Carefully remove the bags from the water (they will be hot) and open the top of the bag – jiggle the omelet onto a serving plate. It will roll right out! Serve with additional toppings of choice, if desired. Jamie these are delicious! I have made them when i have a lot of company and everyone has different tastes! My husband is right there with you on the biscuits and gravy thing! No PB-choc-banana for me, thanks! I've read about these ziplock omelets, but have never attempted them. Seems like a no-fuss thing, though. That is brilliant! We do a similar method with just a single egg when we're camping to make breakfast sandwiches. I've never made an omelet, but I don't think I can go wrong with this idea. Thanks for sharing! Coolest idea ever! I can't wait to try it. Thanks so much for linking up at One Creative Weekend! Enjoy your weekend. We did this camping a few years back. They turned out really well. I've done them a few times at home too. I can't make a real omelet, so I love this version. I never would have thought to make it this way! Thanks for sharing, Jamie! What a good idea! I would never have thought to prepare an omelet like this! Thanks for sharing! I've made these before when the kids were still home, very easy and yummy! Genius!!!! WOW! You made my day with this idea, thank you! We do this when we go camping. It is great way to make everyone happy. Thanks for sharing it on foodie friday. Anything that also makes cooking food fun for kids is a great idea! Thanks for sharing on Foodie Friends Friday! I know you already shared this at One Creative Weekend. Today I started a Gluten-Free Share Page on OneCreativeMommy.com. This recipe would be helpful to people trying to go gluten-free. I would love it if you visited and shared this (and any of your other gluten-free recipes). These look so great. My family LOVES Breakfast for dinner. We have it a few times a month. Thanks for sharing this at Must Try Monday! This is a great idea, I like that you don't need any oil or butter. Good idea! I am going to give it a try. Thanks for sharing at This Week's Cravings. I'm pinning this! I love omelets and I can't wait to try this. Sounds delish this way! I'd love it if you would link this (and a couple other recipes if you'd like) up to Wonderful Food Wednesday at: http://www.athometake2.com. I hope you can stop by. What a great idea, and I will be trying this out, how convenient and easy – look things like this! Thanks for sharing your inspiration with Sunday’s Best – you helped make the party a success! I like this idea so much that I pinned it and shared the pin on my Facebook Page. Please stop by OneCreativeMommy.com and grab a featured button. Thanks for linking up to One Creative Weekend. The new party opens tomorrow. I hope you’ll be back. Very cool idea, I hadn't heard of it before (and we do go camping!). Will this work with any bag? I always buy the generics, do you think it will be heavy duty enough?